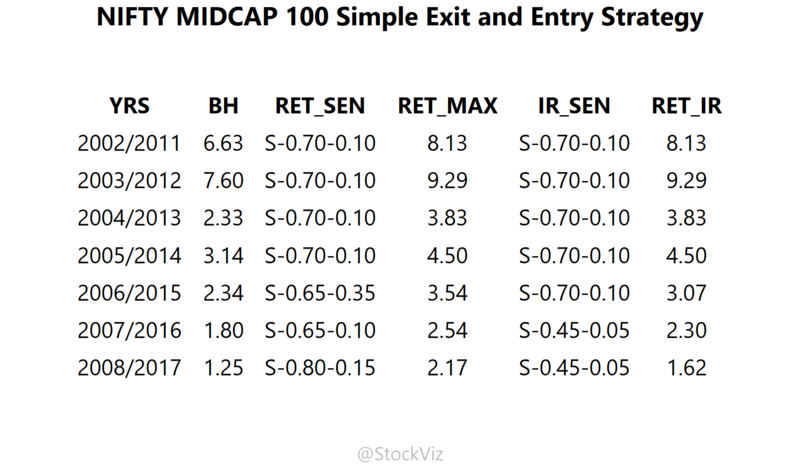 We previously looked at a couple of popular “buy the dip” strategies – one based on SMA crosses and another based on drawdowns – and showed how they underperform a systematic daily SIP. Further, we showed how a daily SIP is not that different from a monthly SIP here. These studies were based on maximizing the terminal asset size. i.e., a strategy was labeled superior if it accumulated the maximum number of units of an index, mutual fund or stock. They weren’t trading strategies trying to maximize profits but investment strategies looking to maximize assets. Here, we turn our gaze to a strategy that lies in between investment and trading – exiting based on profit-booking and re-entering. Once the long reaches a profit threshold, exit. Stay out of the market until a drawdown point has been reached and then re-enter. 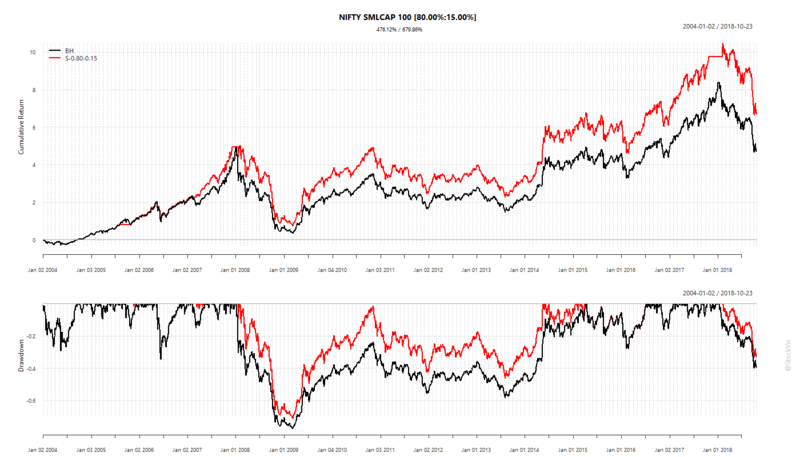 Do this for NIFTY 50, MIDCAP 100 and SMLCAP 100 indices. The tables below collate returns for 10-year rolling windows. 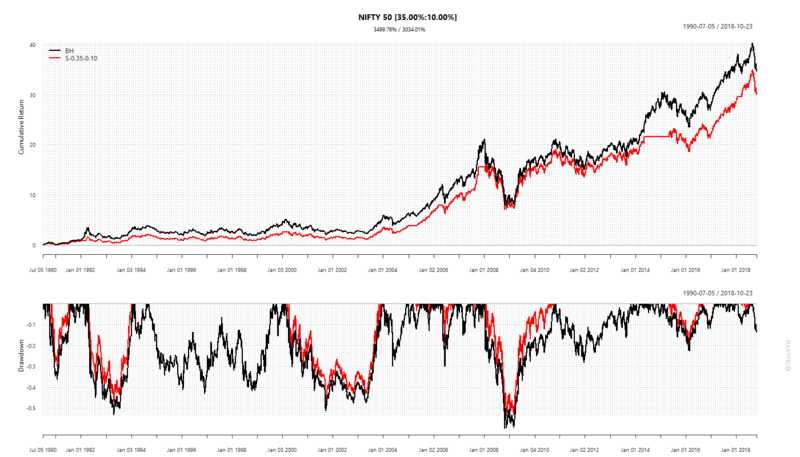 ‘RET_SEN’ and ‘RET_MAX’ are the scenarios that produce the best returns, respectively. ‘IR_SEN’ and ‘RET_IR’ are the scenarios that produce the best information ratio and its corresponding returns, respectively. 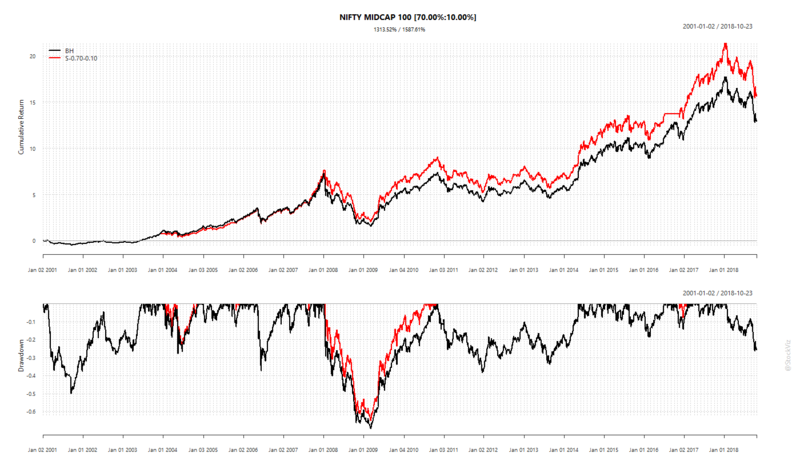 Applying the strategy to MIDCAP and SMLCAP seem to have some merit. 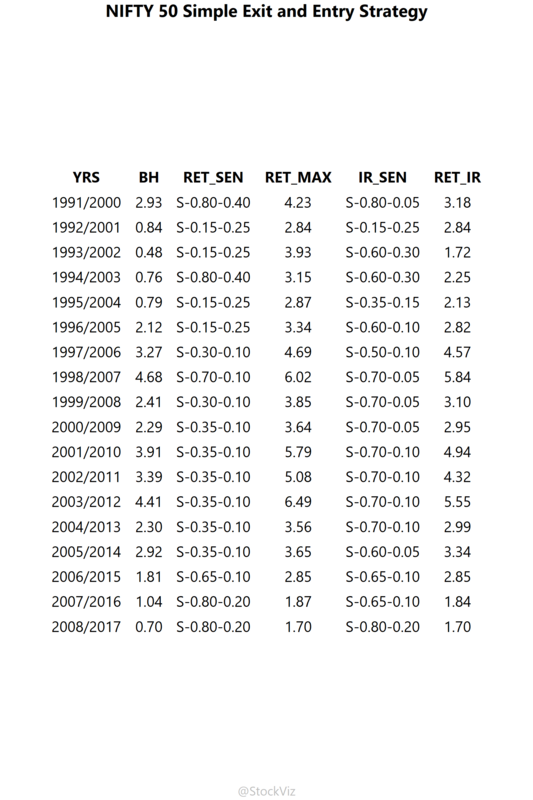 However, when you look at the yearly returns chart, it is obvious that a bulk of the out-performance came from just two or three years of the ~20 year dataset. Another key observation here is that these strategies do not offer any significant downside protection. Also, these back-tests do not incorporate the tax impact and transaction costs of these strategies. “Book profits and re-enter at a lower level” may sound like a nice thing to do but there is no consistent rule that can be applied that can justify the added costs and tax impact. Code and more charts on github.